At age 22, Becca Center has already embarked on an entrepreneurial path to her dream career. 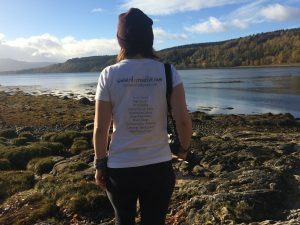 She is a very creative and self-sufficient individual who finished at Edinburgh Napier University last year with the world at her feet. She decided that graduation was the perfect time to chase her dreams of managing her own business and working with a variety of clients. Starting your own business is always a challenge. Becca has become used to people asking her if RK Creative is just a side job and even recommending adverts for employed jobs to her. However, her close loved ones have been a great support throughout, particularly her partner Daire. 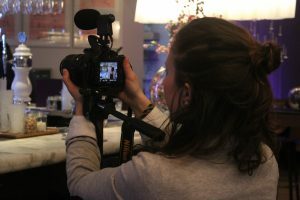 Daire assists Becca on photography excursions and utilises her business management education to help develop an effective business strategy for RK Creative. Becca is certainly taking her venture seriously, as she has already achieved a lot in this past year and gained extensive experience and knowledge. One highlight includes working in Copenhagen with NB Distillery’s Danish team to set up and structure a global social media plan, and shoot product photographs and video content. Becca also does not let her young age be a barrier. She sees being in her early twenties as an advantage because she can be seen to potential clients as more technologically advanced, open to remote working and adaptable to different types of projects. “Overall, I am really pleased with the risk I took and I am driven to making this a sustainable career. I would say to any graduate, as well as applying for graduate roles and other positions, consider other options including self-employment too. There is a lot of scope and opportunities out there for independent business owners. About RK Creative: RK Creative specialises in delivering visual and digital marketing solutions for brands, businesses, charities, social enterprises or self-employed individuals. The company was launched in May 2016 when business owner Becca graduated with a 2:1 honours degree in Communication, Advertising and Public Relations from Edinburgh Napier University. RK Creative has produced many communication materials and solutions for a variety of brands including NB Distillery, Floorplay Events, J Boult Designs, Gordon Nicolson Kiltmakers and House of Elrick Gin. RK Creative is passionate and proud to represent the creative industries as a reliable and effective business service available to all. If you would like more information about this topic, please visit the website of RK Creative at www.rk-creative.com, or email Becca Center at becca@rk-creative.com. Disclosure: I was approached to write this blog post for promotional reasons. If you are interested in receiving a similar service from me, please contact me at toks@tavaservices.co.uk. Beautifully presented. Great work Toks.